This spacious and sunny apartment is right in front of the beach of Aguieira, one of the most beautiful beaches in Galicia. The house is situated on the second floor, has 3 spacious bedrooms, 1 bathroom, a fully equipped kitchen, a living room and a garden with beautiful sea views. The house has a private parking space and direct access to the beach. Perfect for a relaxing holiday and to enjoy the sun, the beach, the food and the hospitality. 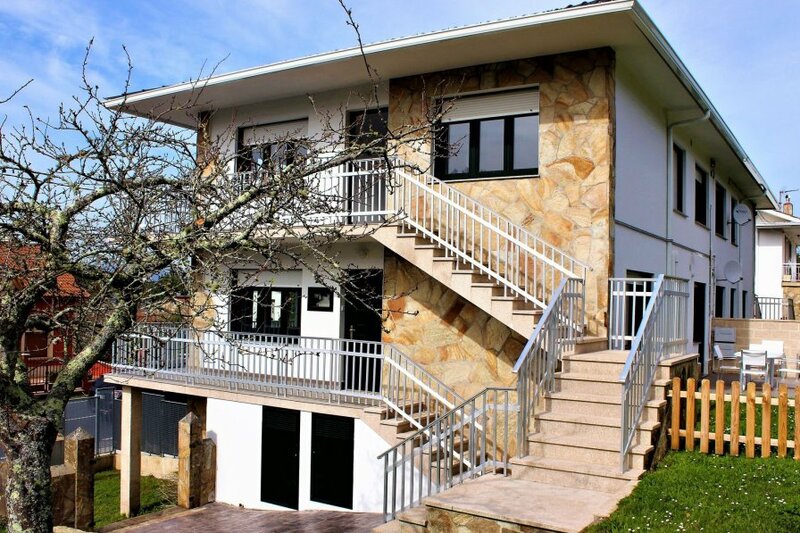 The house is located in the Rias Baixas, just 1.5 km from the village of Portosin, known for its delicious cuisine, mild climate and beautiful beaches. The climate in this region is mild all year round and the summer has many clear days with very pleasant temperatures. The area is perfect for practicing all kinds of water sports such as surfing, sailing and fishing. Within a radius of 25 kilometers you can visit famous places like the Natural Park of Corubedo, Castro de Baroña, the Sierra del Barbanza or the medieval cities like Noia, Porto do Son or Pobra do Caramiñal. The airport of Santiago de Compostela is less than an hour away.